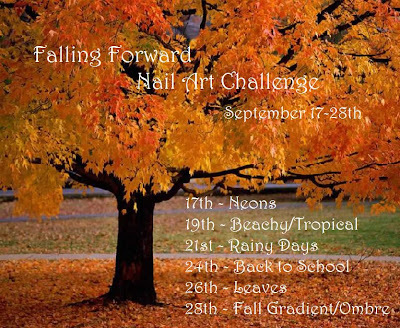 Today's post features Day 2 of the Falling Forward Nail Art Challenging. I struggled a bit with the idea for my mani because I kept taking the theme very literally. 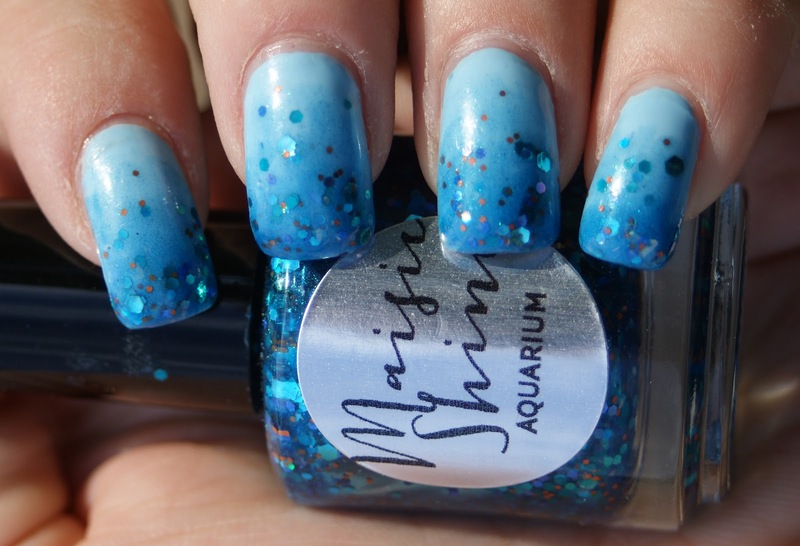 And then looking through my stash, I landed on Maisie Shine Aquarium and came up with an idea that I wound up adoring: a blue glitter gradient with just TWO different polishes and NO mixing! I used two coats of Piggy Polish It's All About Blue, a pale blue creme polish, as a base. Then, starting slightly above the half moons of my nails, I brushed on a thin coat of Aquarium. I repeated the process, starting closer to the tip each time. This created a light to dark blue gradient, as well as a glitter gradient with a greater concentration of glitter at the tips. I love how this glimmers in the light, reminding me of seaweed and bubbles and fish swimming around the ocean. I'm kind of obsessed with this right now. The best part of all is that I didn't need cosmetic sponges or color mixing or a crazy amount of clean up. This literally took me all of twenty-five minutes to paint on. Seriously. So what do you think? Have any jelly glitters you might want to try this out with? So pretty!! I need Aquarium... Ive been wanting it for forever! So pretty! Looks so calm! Aquarium is beautiful!